Q: Where do funded ratios stand in 2018 and how might they impact derisking plans? Trainor: This has been a good year for corporate plans, with the average funded ratio up about four percentage points to 89% as of August 31. That puts funded ratios just past their prior peak. We think that means more plans may be hitting the next derisking trigger on their glidepath, which would call for adding to long-duration bonds. In fact, we’ve spoken to a number of plan sponsors recently who said their funded ratios were still a little shy of their next glidepath trigger but decided to take that derisking step anyway, because they wanted to lock in some of their funded-ratio gains rather than run the risk that conditions reverse. Plan contributions may be another catalyst for derisking, particularly given the tax incentive to contribute before the September 15 tax-filing deadline. We think 2018 contribution levels could be as high as the $76 billion that US plan sponsors contributed last year, and potentially even higher. Q: Given the potential increase in derisking activity, conditions in the rates and credit markets will be important. Where do conditions stand today? Fitzgerald: In 2018, the US Treasury rate curve has flattened significantly, driven largely by an increase in yields on shorter-maturity Treasuries. Against this flattening in the Treasury curve, the investment-grade credit spread curve has steepened. What explains this steepening? When US tax reform passed in December 2017, not only was it expected to result in a positive growth impulse for the economy, but the market seemed to finally engage with the idea that the Fed was serious about raising rates. This accelerated the sell-off in front-end Treasury yields that started in the second half of 2017. That sell-off and the flattening of the rate curve were significant for long credit spreads for two reasons. First, investors who didn’t explicitly need duration to hedge a liability were now able to pursue similar yields by investing in securities with much shorter duration; on the margin, this cannibalized some demand for long-end credit. Second, we saw both the rate curve and the spread curve flatten in the second half of 2017. We believe this was tied to significant demand for long credit among non-US institutional buyers who hedged their US dollar exposure. As US rates moved higher, those currency hedges became more expensive. This has reduced demand for long credit relative to 2017. Q: Aggregate issuance in the investment-grade credit market is down this year. What’s been driving this decline? 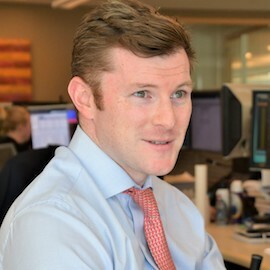 Reece: Coming into 2018, we expected supply volumes to fall, driven by the impact of several changes in the 2017 tax reform, including deemed repatriation, a lower corporate tax rate, and limits on interest deductibility, which diminished the appeal of debt in the capital structure for most investment-grade issuers. Supply is running a little more than 5% below last year’s pace, with the decline largely attributable to the complete absence of large holders of overseas cash in the primary market. Given the tax reform, they now enjoy unfettered access to their overseas moneys and have limited plans to raise debt in the near term. Over the medium term, we expect debt levels to fall for two reasons. First, the cumulative impact of tax reform should incent companies to reduce leverage. Several large investment-grade issuers have said that incremental uses of improved cash flow on the heels of tax reform will include reducing gross debt or funding pensions, both of which are music to the ears of credit investors. Second, recent moves higher in both Treasury yields and spreads have left the cost of new debt largely in line with maturing coupons, which should also diminish issuer appetite for new debt. Another issuance trend we’ve observed is companies, and especially nonfinancial companies, looking to issue longer-maturity bonds. We think there are two reasons for this. The first relates to the current flatness in the yield curve. If a 5-year bond and a 30-year bond offer a similar yield, a risk-conscious investor is likely to choose the former. But given the choice of offering a 5-year bond or a 30-year bond at the same yield, an issuer would opt for the latter. That’s really been the case with new issuance this year, and it has affected the market’s perception of its own risk, which is another factor pressuring spreads wider in the long end. The second reason we think corporate issuers are opting for longer-maturity bonds is that they have recognized that long bonds have been the area where demand has been most stable, due in large part to pension plan demand. Q: Have you seen an uptick in demand for long-duration assets and how has that impacted spreads? 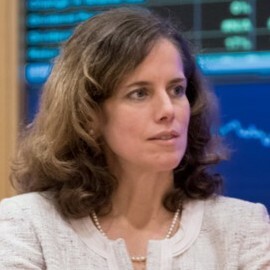 Reece: Amy has done some analysis that suggests there could be $40 – $100 billion of market-wide demand for long-duration assets in 2018, and based on reported manager activity, we expect that inflows already approached the low end of that range as of June 30, two and a half months prior to the September 15 tax deadline. The demand is visible in the Treasury STRIPS market. STRIPS involve decomposing a coupon-bearing Treasury into its component principal and interest cash flows, with the objective of allowing investors to purchase a specific cash flow. For most plans, the strategy typically has been to buy the longest-dated principal STRIP to pursue the greatest hedge ratio improvement using as little capital as possible. Demand for long-duration credit has increased as well. This brings us back to the question of why spreads have widened. My sense is that the uptick in demand for long credit from plan sponsors has been insufficient to offset significantly weaker demand from other buyers, including total return investors, retail investors, and the non-US investors to which Connor referred earlier. Q: What about the longer-term outlook for long-duration demand relative to supply? 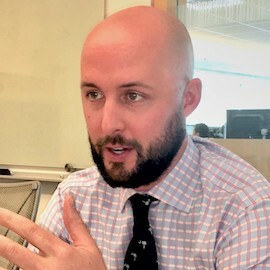 Trainor: I estimate that US corporate plans will shift approximately $700 billion into US long corporate and long government bonds as they move forward with derisking. That represents 20% – 25% of current supply. What’s more, there is limited secondary market supply, given that it’s usually buy-and-hold investors, such as pensions and insurers, who are interested in long bonds. So this is going to be an important technical force in the market. In terms of the timing of this demand, as Schuyler mentioned, we’ve estimated that $40 – $100 billion of it may materialize this year due to accelerated contributions. The timing of the remainder of the demand will, in my opinion, be a function of rising funded ratios and rising interest rates. In other words, it’s market dependent. Q: Turning to some potential risks, the share of BBB rated bonds in the investment-grade corporate bond market has grown substantially. Do you worry that the market is becoming riskier as a result? Fitzgerald: We don’t think the market is meaningfully riskier today, and to understand why, we think you have to look under the hood at what’s driving the increase in BBB rated bonds. The lion’s share of the increase has come from the financial sector (light blue line in Figure 1). In 2012, Moody’s downgraded the ratings of 15 large banks due to increased risk within their capital market operations. Then in 2015, S&P followed suit on the downgrades, citing uncertainty over future government support for the banks in the event of a crisis. It is our opinion, however, that the banks have improved their credit profiles, partly as a result of regulation designed to reduce systemic risk. They have bolstered their capital buffers, improved asset-quality metrics, reduced loan net charge-offs, and enhanced their liquidity profiles. 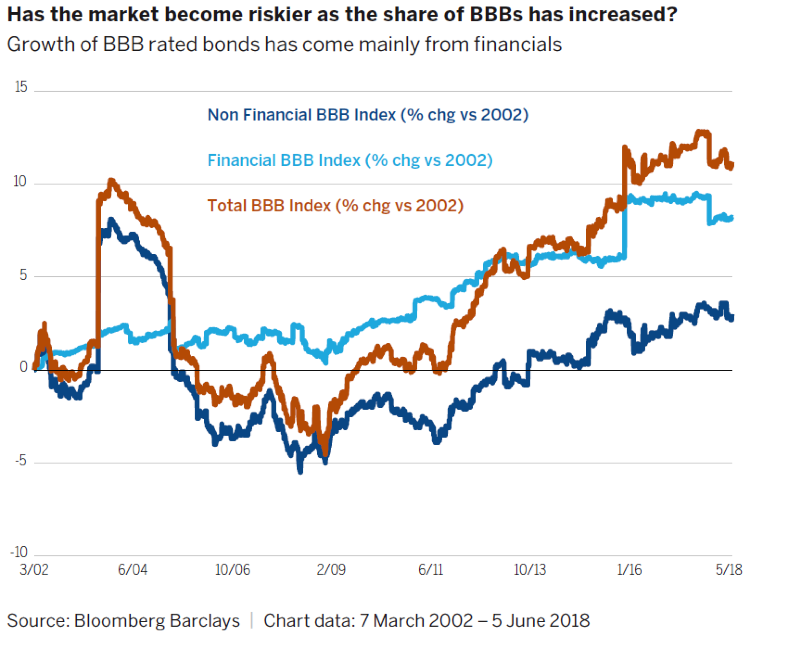 Therefore, we would argue that this segment of the market actually has better credit fundamentals today than when it had higher ratings a decade ago. The other driver of the increase in BBB rated bonds that I would highlight is downgrades in non-financial sectors that were related to releveraging activity and other negative credit events. But some historical context is warranted here. Going into the global financial crisis, non-financial balance sheets, broadly speaking, were in good shape. Many non-financial companies had cleaned up their balance sheets in the aftermath of the tech bubble. So using 2008 or 2009 as the starting point for changes in credit quality is, in my view, not a fair comparison. I would argue that was almost peak credit quality for investment-grade non-financial balance sheets, looking back over the last 20 years. So while industrial credit quality has deteriorated on the margin, when we look at the bigger picture, we don’t believe there is any large systemic or marketwide concern. Q: As we’ve discussed, the yield curve has flattened significantly. What are your views on interest rates and the shape of the curve going into year’s end? Reece: In the US, a still-healthy cycle, a firming labor market, and a strong inflation backdrop seem likely, in our opinion, to keep the Fed very engaged with its gradual path of tightening. Additionally, the tax cuts and the expansionary budget should drive a significant uptick in Treasury issuance, particularly in the front end of the market. Based on what we’re seeing in the forwards and swaps markets, it seems that market expectations are converging around an interest-rate level of about 3%. We expect modest upside above this figure, especially relative to the forwards market, and think this makes a case for being short duration, with a modest bias for steepening — again, relative to the very flat levels implied in the forwards market. As for the yield curve, the concern many have is that a Fed very intent on raising the policy rate and an increase in short-dated issuance will pressure the yield curve flatter. Here I think we have a bit of a differentiated view. First, the signaling power of a flat yield curve seems likely to have been diminished by still-low levels of global yields, driven by more than a decade of expansionary monetary policy. Second, the September 15 deadline to make tax-advantaged plan contributions clearly led to an uptick in long-duration demand, as we noted earlier. Third, and perhaps most importantly, the tightening in financial conditions implied by a flat curve typically has a fairly long lead. So there may be some room for above-trend growth to continue, especially if the tax cuts can deliver any meaningful multiplier. That said, we are conscious that financial conditions broadly have started to tighten, though at a measured pace. Q: Amy, you’ve written a lot about the risks of underhedging a plan’s liability. Do your views change when the yield curve is flatter? Trainor: Underhedging the liability can potentially result in a long-term negative expected return due to the cost of carry — i.e., the yield on the liability compounds at a faster rate than the yield on the underhedged portfolio, making it more difficult to keep up with the liability. This should be less of a headwind in a flatter yield curve environment, but it can still affect the potential liability-relative returns from underhedging. This is another way of saying that interest-rate risk may be uncompensated risk.